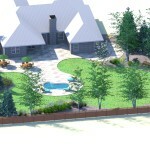 Lets get back to that backyard landscape design we have been working on and lets finish it up. 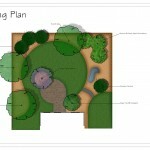 In my last post on this design process, we defined the turf area and we added plants to define the patio space. We ended with this view. A simple plant palette does not distract from the view of the lake. 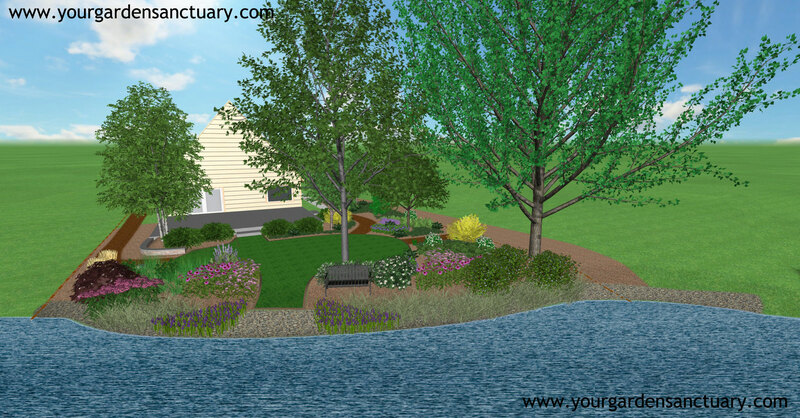 Remembering our goals for the backyard landscape, I will point out some of the features that help to meet those goals as we go. Let’s get on with it and take a look at the landscape from a birds eye view from the lake. I hate rip rap shorelines. Sure they do a useful job of controlling shoreline erosion when properly done, but in most cases for smaller inland lakes they are completely unnecessary. Native vegetation can do the job better, more attractively and usually cheaper. Native plants also benefit wildlife by providing habitat and food. If you don’t like wildlife, get off the damn lake and go live in a condo in Schaumburg! Anyway, I am burdened with existing rip rap I am too cheap to remove. So my solution is to plant into and around the rip rap with plants that will spread by seed or vegetatively (for instance by suckering). Here are the four main plants I will be using for this. Planting a rip rap shoreline is not easy, but these native plants will be among the first planted. This yellow version of the commonly seen red twig dogwood is native to my area and grows along river banks; lake shores; wooded or open, wet areas. It will be planted above the rip rap, but spreads by suckering and I hope to encourage it to grow into the rip rap. 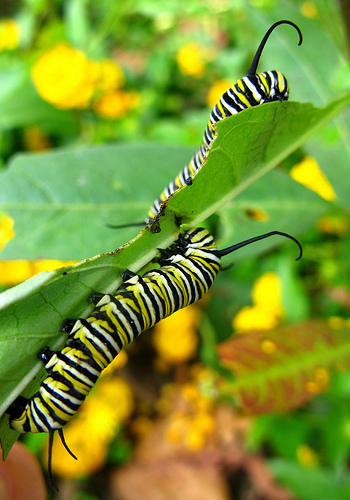 Don’t like common milkweed, but want Monarch butterfly caterpillars in your yard? 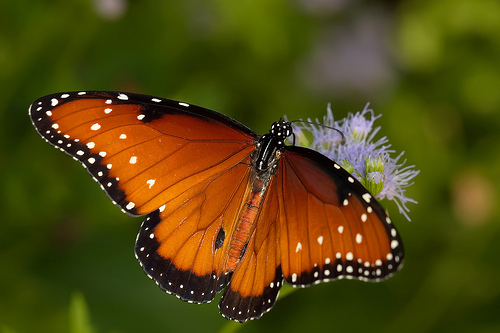 This is a great choice as it is Monarch preferred host plant. It also works especially well in wet areas. This staple plant of rain gardens will be planted above the rip rap but I hope it will seed into it and spread. 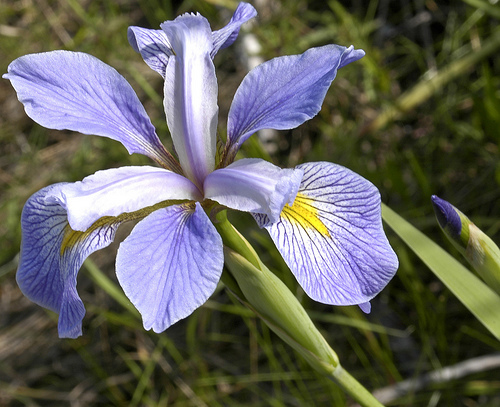 This is a showy native iris is surprisingly common in most areas of Illinois. 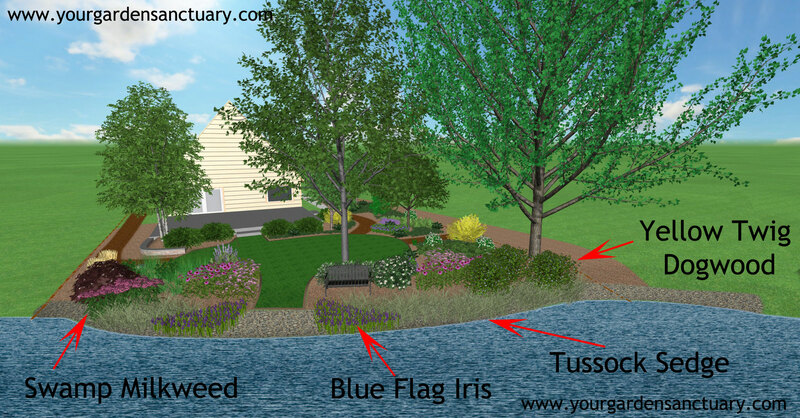 Nice texture, wildlife value and nice purple flowers make this an obvious choice for naturalizing my shoreline. The flowers are pollinated by bumblebees and long-horned bees. 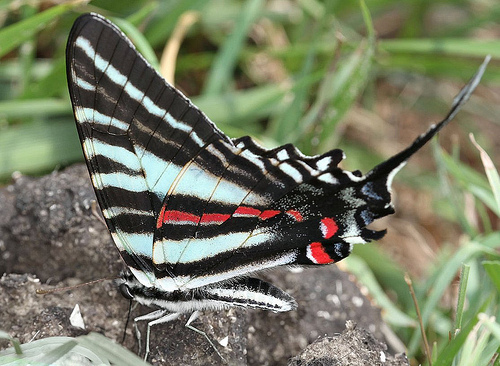 Butterflies occasionally visit the flowers. I will be planting a lot of small plugs and hope for a lot of big plants in a few years. 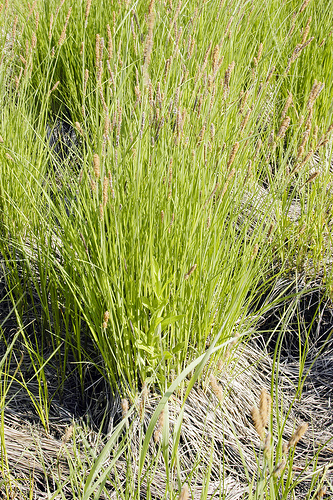 This plant is more commonly seen in wetlands and wet meadows. 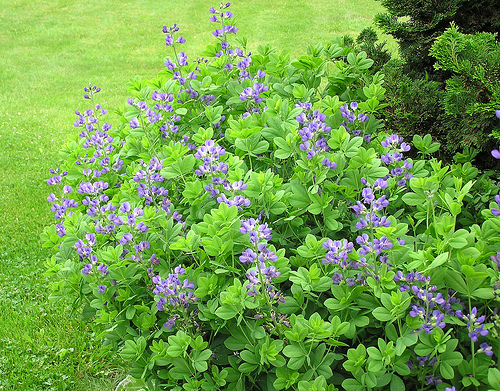 It forms dense tussocks of straw-colored leaves at the base with bright green new leaves emerging from the top if grown in water. The tussocks create great places for small wildlife to live. It spreads by rhizomes which is one reason I am planting it. Another good attractive native sedge I will probably add is Fox Sedge (Carex vulpinoidea). Here is just a couple of the native plants I’ll be using that look great and some of the butterflies they support. I won’t even go into birds or this post would never end. 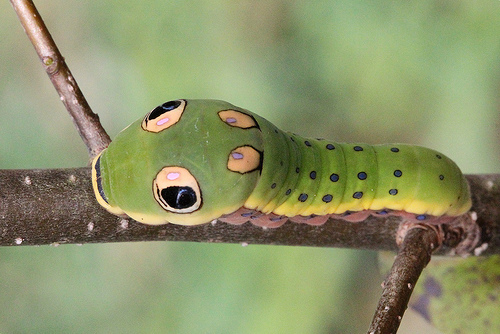 Spicebush (Lindera benzoin) – Attracts: Birds , Butterflies Larval Host: Eastern Tiger Swallowtail (Papilio glaucus), Spicebush Swallowtail (Papilio Troilus), Promethea silkmoth (Callosamia promethean). 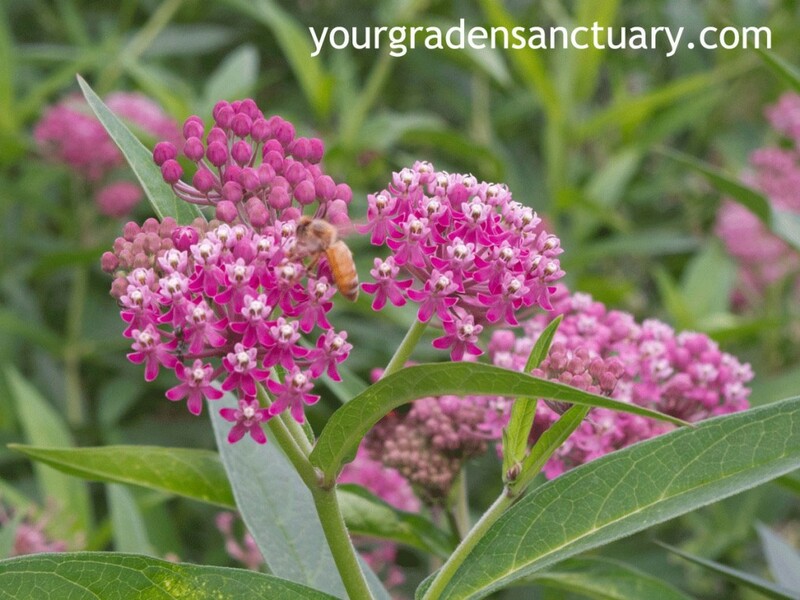 Butterfly weed (Asclepias tuberosa) – Attracts: Butterflies by the ton, Larval Host: Monarch (Danaus plexippus) and Queen Butterfly (Danaus gilippus). Paw Paw (Asimina triloba) – Attracts: Small mammals relish the fragrant fruit which tastes banana-like. These include foxes, opossums and squirrels. Black bears like them too, so I might not plant this if I lived in bear country. Larval Host: Zebra Swallowtail (Eurytides Marcellus) and Pawpaw sphinx (Dolba hyloeus). I won’t go into all the details but here are a few key plants and how they help to meet those goals. The native perennial plants and grasses such as Prairie dropseed, Butterfly weed and Switch grass send roots deep into the soil. This helps to add to build the soil by adding organic matter, aggregating the soil and oh by the way it sequesters carbon. So they help to fight global warming. See The Soil will Save Us for more info on that. They also won’t require any water once established no matter how bad a drought we have. I will also be arranging these in pattern to invoke nature in the form of a simple meadow (see a future post for how this turns out!). The textural contrast of the grasses against the other plants will also provide long lasting interest not dependent on flowers. I will also include a Coppertina Ninebark (Physocarpus opulifolius ‘Mindia’ ) that you can’t quite see in this view. 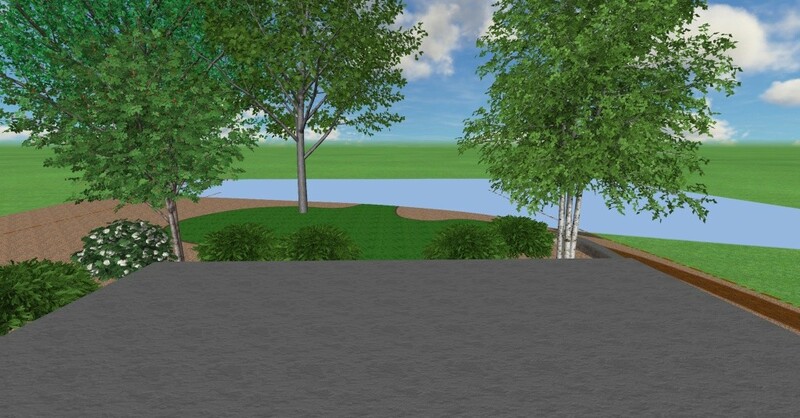 This will help frame the view of the lake and add more purple color that was requested by my wife. 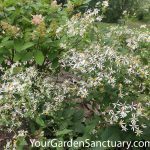 The native smooth hydrangea and Virginia Sweetspire add some nectar for pollinators, although I admit I planted them mainly for flowers and Fall color. The Oakleaf hydrangea is pretty useless to wildlife but I love it long flowering period, fall color and great texture and it is MY yard! 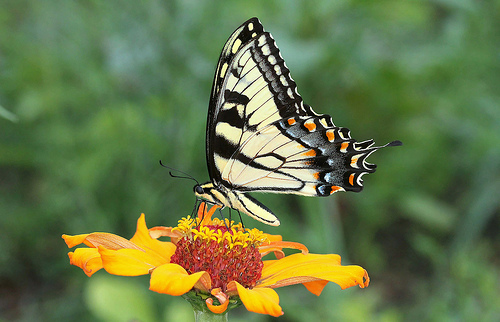 Besides all the baby bird food (see related post) we are providing with host plants for butterflies and moths, we will feed adult birds with seeds and fruit from Serviceberry, Pagoda dogwood, ninebark, Prairie Dropseed, Common oak sedge, Tussock sedge and Purple Coneflower among others. The nativar Coppertina Ninebark Provides a touch a summer foliage color to the shoreline. Love it Jim! Can’t wait to see how it turns out. Very inspiring, thank you for your posts on the design process and implementation. I love your design….. Are you also available to provide direct consultation on a project ? I live on a lake in Northwest Illinois and have just learned that I need to place rip rap to retain the shoreline. I would love to have a more natural landscape. If you are available to consult on this specific project please let me know. I would love to connect with you ! I did send an email to you a while back responding to you using the email address you used to register this comment. 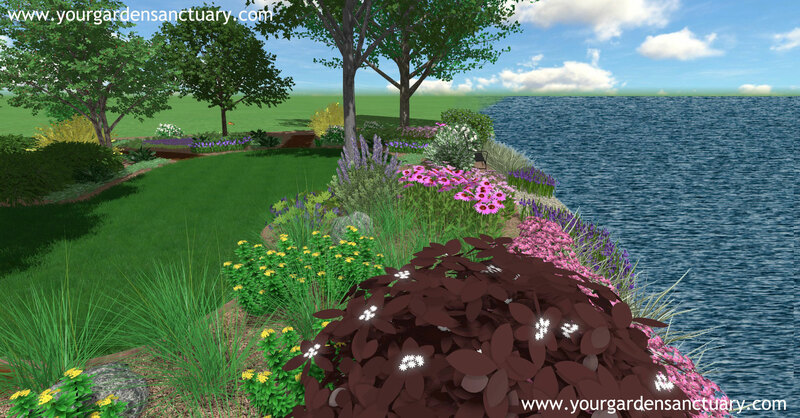 Fabulous landscape design and renderings here. 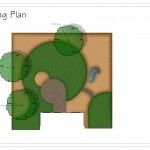 Do you currently offer your services to help out landscape designs companies? We are Best Landscape Installation Boca Raton and could always use someone to look at some of our renderings that we give to clients. Again, great job on the design explanation. I wanted to remark on the Oakleaf Hydrangea’s lack of value to wildlife – mine are *covered* in honeybees in the spring-summer! So they do seem to help pollinators out. That’s great. What area are you located in? We are in Central Massachusetts, zone 5b. It is really cute seeing them buzzing around in those huge cones of flowers, and they come out just covered in pollen! I also notice dragonflies love to use them to perch. I’ve been wondering–what software are you using for your designs?